I'll level with you: I Heart JONAS was one of those titles that-- like the generic photo of the girl with the puppy included in your brand new wooden frame-- arrived in the same Buena Vista Home Entertainment shipment of movies that I was far more excited to review. Yet I'd be one of late, great J.D. Salinger's phonies if I took the easy way out and hid behind the “coolness” exterior to which other critics are susceptible. 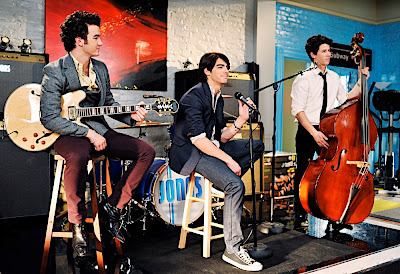 For although I just didn't “get” the appeal of the JoBros in their 3D cinematic concert, this was immediately rectified in their fast-paced, feel-good charmer of a TV series that works like a 21st century version of The Monkees plus the most musical aspects of Brady Bunch and Partridge Family, along with early Beatles fare like A Hard Day's Night. 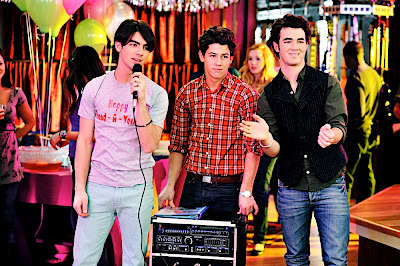 Playing fictitious versions of themselves as a successful but not overwhelmingly famous band, which enables the brothers to go to high school and experience typical boy/girl drama, priority shifts, and the constant testing of friendships, the series navigates traditional terrain but with plenty of heart and humor. Admittedly, it does crank up the cheesiness factor at times as they slide down poles a la Batman in their converted fire house home, and are super tight with a “good-natured” stalker classmate. 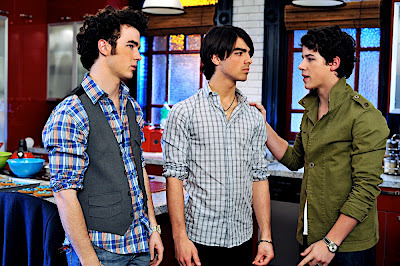 Yet although Nick struggles with having enough to do and seems uncomfortable in front of the camera when he is forced to act, Joe's natural charisma is apparent from the start, just like his chemistry with the series' adorable love interest, Stella played by Chelsea Staub. The brothers' best friend since childhood, Stella who now serves as their stylist and Joe's constant source of romantic angst finds herself tested right along with him for fear that acting on their hormonal feelings will ruin their valuable friendship. And while Staub's sunny turn and professional approach makes us focus less on the acting inexperience of the JoBros, it also hides the overly simplistic characterizations chosen for the guys. More specifically, in JONAS, they become just one specific “type," from which the writers attempt to derive overly similar comedy. While it works for Joe Jonas' girl-crazy “lovesick” cutie, this device hinders oldest brother Kevin Jonas' routine as a blend of Scooby-Doo's Shaggy and Friends' Phoebe that gets old fast as he's forced to play the nice but dim-witted leader with literal and metaphorical humor confusion whereas Nick merely becomes the tech nerd with zero personality. However, even though he doesn't seem to be that at ease in the series, the one thing you do immediately respect about Nick is that he's perhaps the Paul McCartney or Brian Wilson of the group given his passion for arrangement and heightening musicality. And obviously the Disney Channel can't pass up any opportunity to squeeze in a song but instead of just singing to the camera, the series seamlessly incorporates tunes into the love themes and plots of the seven episodes that comprise this enjoyable Valentine's Day themed 155 minute disc. Easy enough to catch up with the basic set-up for newcomers such as this reviewer who thanks to the natural appeal of Staub and Joe Jonas' dynamic managed to get pretty hooked on their plot-line that's woven throughout, I Heart Jonas is a surprisingly entertaining time-waster that also contains Jonas magnets as well for the Valentine's tie-in. 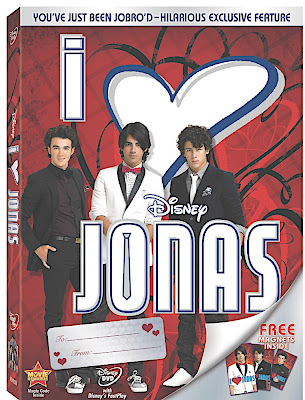 Ideal for parents to give to their daughters, or especially fathers to present to their girls since it's a crucial age for tweens becoming teens, JONAS is fresh and the answer for those of us over the age of fifteen wondering what the appeal about them is based on the 3D Concert alone. Additionally, the disc marks yet another success for not just the Disney Channel but likewise it reminds me that unlike my childhood of essentially Punky Brewster and Saved By the Bell, this generation's DVRs runneth over with quality tween programming on Disney, ABC Family, and Nickelodeon alike.